Their yellow blossoms give dramatic proof of the dandelion’s presence in a well-manicured lawn. This plant inspires both appreciation and abomination. Four-year-olds pick the crayon-box colored disks to make sunny bouquets. Older children blow the silvery spherical seed heads to watch them shatter and send seeds floating through the air. Lawn purists spread herbicides to kill the hated weed. Gardeners dig them out, knowing how quickly they spread and how hard they are to eradicate. The trick is making sure to get the long taproot. Missing any segment will guarantee regrowth. I must admit I dig them out somewhat reverently, though, for I’ve come to see Dandelions as historical artifacts. Dandelions settled in North America with European immigrants. Many of our common weeds arrived the same way. By 1748 observers already claimed they saw French Canadians digging dandelion roots, so they’ve been here a long time. Dandelions were a plant the colonist felt too valuable to be without. They remain an important food crop in Europe and other parts of the world. Originally they came from the Mediterranean regions and were mentioned by Theophrastus hundreds of years before Christ. The colonists were right, dandelions are valuable plants. They contain high quantities of vitamins A, B, C and D and every part is edible. The tangy young leaves can be added to salads, or blanched and served like spinach (old leaves are bitter). Year-old roots can be cooked like parsnips or dried and brewed as a tea or added like chicory to coffee. Historically, the plant was believed to heal health problems with everything from indigestion and constipation to blood disorders. My grandmother encouraged Dandelions greens as a spring tonic to cleanse winter blood. If you check the internet you will find many claims still made for herbal products featuring Taraxacum. 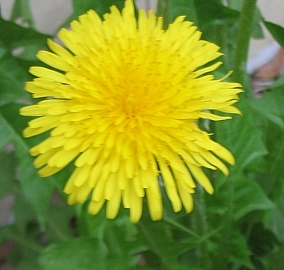 Dandelion was also used as a dye. The flowers provided a yellow color and the whole plant added magenta to the weavers’ craft. Last, but not least, of its virtues, is dandelion wine. I’ve never had it, but it is claimed to taste somewhere between sherry and champagne. Feeling adventurous, I’ve decided I’m going to try making it. (Check out my blog at Night Writers. Pamela Jones, author of Just Weeds), claims the wine has “the most elusive, delicately fragrant flavors imaginable, the color pure liquid gold.” That makes me feel like picking Dandelion flowers. Jones, Pamela. Just Weeds, History, Myths, and Uses. Prentice Hall Press, New York, NY. 1991. Print. Page 217.